Interesting there are 2 batches, one a slightly lower proof for just GA and FL, and another for the rest of the county. I reached out to Brown-Forman to find out why. 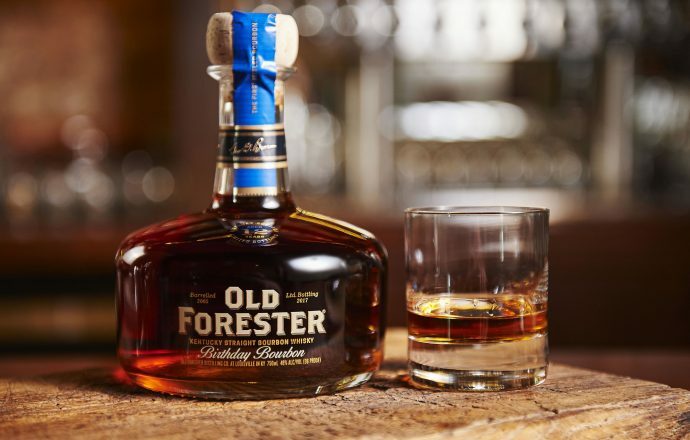 Louisville, Ky. (August 14, 2017) – This September, Old Forester Kentucky Straight Bourbon Whisky, America’s First Bottled Bourbon ™ , will introduce its 17th release of Birthday Bourbon – the annual limited-edition expression created to pay homage to founder George Garvin Brown’s birthday on September 2nd. The 2017 Birthday Bourbon barrel selection was drawn from 12 year old barrels from different warehouses and floors on May 27, 2005. 93 barrels matured together on the 4th floor of G warehouse, yielding an extremely spice forward expression. The remaining 27 barrels matured together on the 5th floor of K warehouse contributing a rounding sweetness to the blend. Several barrels from both lots basked in the sun, highlighting the effects of maturation along an external wall in Old Forester’s heat cycled warehouses. The craft of bourbon making- from barrels to bottling- is a mixture of art and science. For this year’s Birthday Bourbon, science plays an integral role in the product story. During the transfer of bourbon from the holding tank to the bottling line, alcohol vapors were lost during bottling, causing the proof to drop. As a result, this year’s Birthday Bourbon will be presented at both 96 proof and 95.4 proof. This distinction is identifiable in the proof statements on the bottle. The 2017 Old Forester Birthday Bourbon will be on shelves with a suggested retail price of $79.99. Florida and Georgia will receive the 95.4 proof expression and remaining states will receive the 96 proof expression. Kentucky is the only state which will receive both expressions with the 96 proof expression shipping first. “The common denominators in this year’s blend are chocolate and black pepper. The finish is interesting, as it really ignites the perimeters of the palate and cascades off into a soft, dry floral bouquet. ” said Jackie Zykan, Old Forester Master Taster on the 2017 Old Forester Birthday Bourbon.